Papuan Blyh's Hornbill (Rhyticeros plicatus) is a species of bird that lives in tropical rainforest of New Guinea and its surrounding islands in the Pacific region. This big bird eats fruits such as nutmeg and ficus. Hornbill birds are often seen flying as a couple, i.e. male and female birds. During fruit season, they fly to fruiting trees in large groups of thirty or even more. Sometimes, we could see a male or female hornbill flying solo if we spend several days camping and birding in the forest. There are several places in West Papua where visitors can go hiking in the forest to watch hornbills. Klasow Valley - It is located in the east of Sorong regency. The lowland forest that covers the valley is the natural habitat of not only hornbills but also other birds such as Pink-spotted Fruit Dove, Beautiful Fruit Dove, Lesser Birds of Paradise, King Bird of Paradise, Pinon Imperial Pigeon, Rufous-bellied Kookaburra, Yellow-billed Kingfisher, Large Fig Parrot. Lowland Forest of Manokwari - It is located in northwest of Manokwari. There is a river that goes through the forest. To watch birds in this area, visitors can walk through the river and then walk along the sand banks of the river. Please, support our efforts in raising awarenes about the importance of preserving tropical rainforest to protect hornbill birds and other endemic animals. 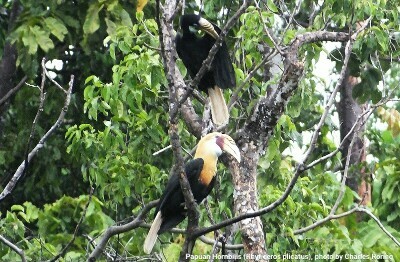 The best spot for watching hornbill is in a wide natural clearing area of the forest such as the banks of a wide river. Hornbill birds are usually active early in the mornings and in the afternoons before sunsets. They can be seen flying from one side of the river to the other. Because of their large body size and wingspan, hornbill can be seen with naked eyes. However, birdwatchers prefer to use a good pair of binoculars to watch the detail parts of the bird when it flies or when its sits on a branch of a tree. To take pictures of hornbills, photographers or birdwatchers need camera with telephoto lens. The number of Papuan hornbill population is still abundant in the forest of West Papua. So, it is not considered as endangered species. However, continuous hunting and logging activities have pushed hornbills to migrate to deeper area of the forest. In the past, birdwatchers could still watch birds at the nearby forest of cities in West Papua. Now, they have to go further by cars or motorcycles and walk deeper into the jungle to watch such birds.